The BTF Partnership LLP are an independent firm of Chartered Surveyors who aim to meet 100% of their clients' needs by providing a uniquely comprehensive service. A local solution that is versatile, effective and genuine. 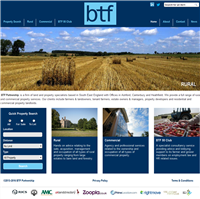 With a Commercial Lettings office in Canterbury and Rural offices in Challock, Kent and Heathfield, East Sussex, BTF provide a trusted service to the Business and Agriculture sectors as well as providing a rural Estate Agency. BTF required a Website that catered for both their Commercial and Rural offices in Kent and East Sussex. Using Tektonic's Content Management System, the Client is able to upload property details and imagery to the website. The site has an Auction module which highlights the dates of up-and-coming events, enables catalogues to be downloaded by visitors and enables past auctions to be automatically archived. There is also a restricted area for members of BTF's 50 Club, which provides a secure area for members to get news briefings, download legal information and receive up-to-date advice. Tektonic provide practical, cost effective solutions and focus on what the client actually wants to produce. They are extremely approachable and do not use unnecessary technical jargon to intimidate or confuse ! Tektonic produced an excellent website which we are able to update and manage the content of ourselves. The cost was considerably less than we had been quoted elsewhere and the project was completed within our timeframe. We would certainly use them again and would have no doubts about recommending them to others.